Imagine you're leaving a tip in a bar or a restaurant. You typically assume a percentage, like 10% of the total price. But the total price is not what the restaurant gets - a part of the money you leave is there because of the taxes. If you want to tip your waiter basing on the net price instead (as is customary in most countries), you've come to the right place. 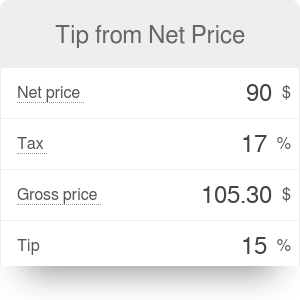 In most countries, we tip based on the gross price (in other words, the price that includes the tax). For that purpose, use our regular tip calculator. So what's the difference between the net price and the gross price? To put it simply, the sales tax or VAT. Look at the bill the find out the gross price. Let's assume it's $50. Check how high is the tax - let's say it's 23%. Decide on the tip you want to leave. Let's say you feel generous today and want to leave 15% tip from the net price. Calculate the net price according to the formula above. It our case, net price = gross price / (1 + tax percentage) = $50 / (1+0.23) = $40.65. Find the tip from the net price: 15% * $40.65 = $6.10. Add the tip to the gross price to find out how much you need to pay altogether. In this case, $50 + $6.10 = $56.10. Tip from Net Price can be embedded on your website to enrich the content you wrote and make it easier for your visitors to understand your message.